Sleeplessness picked at my brain and tickled my body last night until I finally gave in and retreated to the recliner and my old journals. Stretching back over forty years, these journals have become my counsellors, my instructors and often my accusers. They remind me that an honest working title for my life thus far would be, “Stumbling Disciple.” I’ve vacillated from mountain heights of glory and inspiration, to lonely valleys of failure and despair; from exotic places and experiences of God’s faithfulness, right down into hopelessness and crushing doubt. I’m amazed at the glorious, giddy truths the Holy Spirit has given me, and appalled at the scope of what I’ve already forgotten. These writings keep my life in perspective. Last night I noticed that under the steady passing of years, one cadence seems to drone like a soundtrack to my life: “Not enough!”: Not enough prayer; not enough worship; not enough accomplishment; not enough practicing, writing, compassion, exercise, serving, witnessing, faithfulness or creativity. The nagging voice of “not enough” seems to greet me in the morning and chatter on until I fall asleep at night. Note: I know I’ve been AWOL from this blog for too long. It’s not because I haven’t written, but rather because I worry that what I’ve written isn’t fresh enough or inspiring enough. Nevertheless… here goes another determined attempt to do better. The great missionary and statesman, E. Stanley Jones said, “The Kingdom is God’s total answer to man’s total need.” But tragically in Western Evangelicalism we have replaced the “Gospel of the Kingdom”, (which is what Jesus actually taught), with “The Gospel of God’s answer to guilt”, (which, although it’s implied, Jesus never actually taught). A close examination of Scripture from Genesis to Revelation reveals that God’s salvation means a total healing of the wretched mess we’ve made of God’s creation since the fall of man. From the moment of Adam’s rebellion, nature became uncooperative and filled with “thorns”, brothers murdered brothers, violence marshaled armies and war machines, bodies and souls became diseased, and suspicion and alienation supplanted love and trust. Sin is a cancer that ruins everything it touches, and a misdiagnoses will guarantee certain calamity. Sounds like a pretty accurate assessment of our condition doesn’t it? Lack of kindness, adultery, deception, bloodshed, people languishing, fish dying, animal life being stressed; Seems like I just read about all this in the morning news. THIS is our problem! The cancer is much worse than we imagined: Sin has metastasized and poisoned the entirety of creation, and what we need is a radical cure that reaches into every part of creation with it’s healing balm. The Kingdom is that cure: Jesus has redeemed all things beginning with the hearts and souls of people. Coming to him in faith is the first life-changing step, but the full cure lies in carrying His healing into everything we touch until the world shines with glory and grace. How do we do that? By drinking deeply from the well of Christ and becoming purposeful, intentional disciples of Him. Apart from these, we have little to offer our sick world. Throughout history God has spoken through prophets, angels, scriptures, stone tablets, and even a donkey. But in his final attempt to reach our darkened hearts He sent His Son. “The Word became flesh and lived among us”. He loved us, taught us, and showed us the true face of His Father. God did not reveal himself as a philosophy, a set of commands, a book, or a religion, because none of those means could accomplish the task of “making all things new.” Only Jesus could could accomplish such a thing. And so He presented Himself in evidence and issued a simple invitation: “Believe in me”. Jesus didn’t come to simply save us from our sins. He came to remake the world; to offer the human race a “do-over”. He is not merely the Savior of my soul or the centerpiece of the church; He is the center of ALL things. “[God] planned to bring all of history to its goal in Christ. Then Christ would be the head of everything in heaven and on earth.” (Ephesians 1:10) We modern believers are still weak on this concept, wanting to reduce the gospel to a personal experience and roadmap to a future in Heaven. But that is not the Kingdom! The Kingdom is that universal dream for a perfect world that every person carries in his heart. Newsflash! God carries that same dream! Nothing could be more simple. Jesus said the world would actually recognize us by our love. So they do, right? Not quite. They sometimes recognize us by our judgments, boycotts, and religious pride. Other times they don’t recognize us at all. If we were to actually demonstrate this one thing – loving others supremely – the world would virtually throw open it’s heart to the Gospel! And finally – after we’ve begun to master these first three commands, we are called to make disciples of others who will make disciple of still others in this rich and living way that puts the world back together again and fills everything with glory. One of my prayers for 2017 is that I will grow in the area of discernment. All the “fake news” talk we’ve been hearing about lately isn’t really news for many of us. We’ve known about partisan sites, conspiracy sites, and sensationalist sites forever, but the problem lies in spotting them when they support the very same ideas that I hold so dear. So as one who deeply cares about Truth I’ve been asking God for the spiritual gift of discernment. How amazing it would be to clearly hear the Spirit whisper, “No son… don’t fall for that. It’s a lie”. I’m also learning that Truth seldom resides at the extremes. C.S. Lewis says, “The Devil sends lies into the world by pairs”, and of course he does it to divide people and communities. The “free will” versus “God’s sovereignty” debate has kept the church tied in knots for centuries. But what about today’s “liberalism” versus “conservatism” debate? Does the Truth reside at the extreme end of either of those worldviews? Lewis suggests that the Truth often lies in the tension of the middle. It’s not that God is mushy in regard to Truth, but he certainly is neither a political conservative nor a liberal. He is the solid reality behind our foggy ideas. As a young boy my family would often walk the fifteen minutes to church on Sunday mornings, crossing a bridge that passed over the Potomac river from Maryland into West Virginia. From the sidewalk we could look through the metal grating and see a river the color of gray paint with thick islands of toxic industrial foam inching by under our feet. The thought of getting anywhere near that river was a horror to my young mind. It was an unbelievably polluted and dangerous eyesore. And yet today that same river hosts fishing rodeos and kayakers enjoying its clear water and gentle currents. The Potomac has become for me an example of how the world is becoming a more glorious place. It is a symbol of the progress of the Kingdom. Concerning Jesus, Isaiah prophesied “… of the increase of His government, and of peace there will be no end.” (Isaiah 9:7) But we Believers often get stuck in a negative faith not focused on God’s growing government and peace, but expecting multiplied wars, increased suffering, and a freshly empowered Antichrist in the days ahead. Is it possible we’ve gotten it wrong? Did Jesus actually mean for His Kingdom to grow like a mustard seed until it fills the earth, or are we to expect darkness and unleashed chaos in the days ahead? Consider these four concrete examples of a hope and optimism that just might reveal a growing Kingdom. There are many others which could be included, (like the condition of our rivers, air quality, violent crimes, child welfare, and racial equality to name only a few). 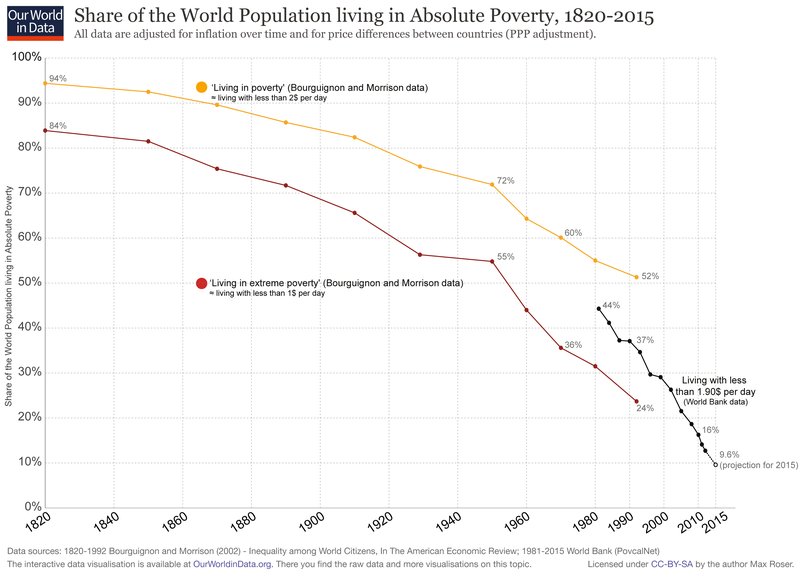 Poverty: Although we still have much work to do, world poverty levels have been falling steadily since 1820 when nearly 90% of the world was living in extreme poverty, (less than $1.90 per day adjusted). Today, as seen in the chart below, that number has fallen to less than 10%! This is AMAZING progress! Life Expectancy: In 1900 the worldwide average life expectancy was a mere thirty-one years. By 1950 it had risen to forty-eight years. And by 2010 it had reached sixty-seven years. And of course this is another wildly wonderful thing to celebrate! 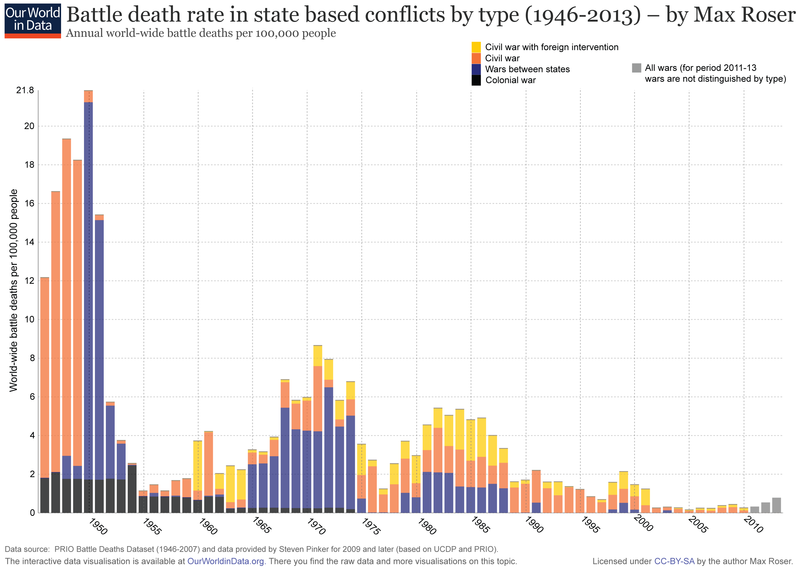 War: In spite of the endless media attention given to war and violence, we have actually seen a sharp decline in the casualties of war over the past seventy years. Consider this chart from http://www.ourworldindata.org. The Spread of Christianity: We Westerners tend to judge the health of the church by looking at the condition of our local congregations. But too often we overlook the rest of the world where the church is growing at astonishing rates. The church in China, Asia, Africa, South America, and even in some Muslim countries is seeing phenomenal growth. For a little perspective, consider that on the day of Pentecost about three thousand people came to faith in Jesus. That was an unbelievable number of converts! But today, according to James Rutz, author of Mega Shift: Igniting Spiritual Power, we are seeing – on a world scale – about 3,000 people coming to Christ every fifty-four minutes! That’s about 80,000 new Believers every day! As we face into 2017 lets take heart and believe God not for increasing darkness, wars, and multiplied human suffering. Instead, may we hitch our confidence to the one who promised, “As surely as I live, all the earth will be filled with the glory of the Lord” (Numbers 14:21). Imagine what could happen if we really began to live and labor as if the mustard-seed kingdom was already well on it’s way. The Rapture or the Kingdom? As a newborn believer The Late, Great Planet Earth by Hal Lindsey was the first Christian book I ever read. Bursting with images of growing darkness, the mark of the Beast, and a living hell under the wrath of the Antichrist, it scared the crap out of me. No sooner had I received the glad news of salvation than I was body-slammed by terrifying projections of what was about to break loose on our doomed planet. Three weeks ago in Eastern Europe a student, (a pastor in a local church), raised his hand and asked, “How long has Youth With A Mission been teaching this new idea about the Kingdom?” Do you see? The Kingdom has become a suspicious “new” doctrine while the extra-Biblical idea of the “rapture” is embraced as the storyline of our future. Never mind that the Kingdom has been a Biblical promise passed down from the prophets to Jesus, the Apostles, Saint Augustine, Luther, Calvin, Wesley, and the Reformers. Rather, it’s the “rapture of the church” that’s a strange new doctrine. Introduced in the 1830s by the Scottish Pastor John Nelson Darby, and adopted by C.I. Schofield in his famous Bible notes, this idea has done unspeakable damage to the church, the world, and the lives of Christians worldwide. From The Late Great Planet Earth to seventeen installments of Left Behind, the rapture has robbed us of our future, our relevance, and our witness. Our fathers in the faith would never have recognized this nightmarish idea that re-energizes the Devil and steals the legacy of our children. If the next event on God’s calendar is the “snatching away of the saints” and a world plundered by the Antichrist, then it becomes a fool’s errand to work for justice, reconciliation, and transformed cities and nations. The scriptures plainly teach that Jesus is returning for His Kingdom. But living in the expectancy of an earth overrun by darkness stands in direct contradiction to the Lord’s own promise of His glory filling the earth. Today I am living in the hope of glory.